Not far from Dinosaur National Monument and halfway between Yellowstone and Canyonlands National Parks, Flaming Gorge Recreation Area is a popular summer and winter destination with an almost endless variety of activities available: boating, fishing, camping, hiking, snowmobiling, hunting, and cross-country skiing. The area is also rich in Western lore and home to hundreds of species of wildlife. Below the dam to Little Hole is 7 miles of crystal clear water teeming with trout and this section of the Green River has earned the reputation of one of the country’s finest trout fishing streams. With its exciting and splashy rapids, Flaming Gorge is also a beloved and ideal section of river to enjoy from a raft. We typically run the Flaming Gorge section of the Green River exclusively in paddle rafts–fun, maneuverable inflatable rafts powered by four to eight passengers with paddles, along with a guide. Paddle rafts offer an active, hands-on challenge and are usually the preferred vessel on most whitewater trips. If you do not wish to be in a paddle raft, we may be able to accommodate you, but we must know in advance. This section of the Green River offers splashy Class II rapids, interspersed with calm sections that inspire swimming, watching for wildlife, and gazing at the canyon scenery. Despite these slower stretches, the whitewater is consistent on the Green. You’ll challenge minor rapids plus lots of smaller waves and riffles. The Green River through Flaming Gorge is ideal for first-time rafters and children as young as 4, but not short on excitement for the whole family. Upon everyone’s arrival at the OARS Warehouse, we’ll take the 1½ hour shuttle ride to our put-in below Flaming Gorge Dam. Once we reach the put-in, your guides will give a thorough safety talk and orientation to the equipment we will be using. Then, we’re off! This section of river is host to many Class II rapids, and with names like Roller Coaster, Mother-in-Law, and Can of Worms, they are sure to please. We’ll run about half of the trip in the morning before stopping along the river for our famous “build-your-own-masterpiece” deli-style lunch. Maybe we’ll play a quick game of Frisbee or just relax and soak in the summer sun. After lunch, we’ll continue the remaining 3-4 miles of Flaming Gorge, taking in more rapids and breathtaking scenery. The expedition ends at the Little Hole Boat Ramp where we’ll board our shuttle and contemplate our memories of a great day during the 2 hour bus ride back to Vernal. We’ll arrive at the OARS Warehouse between 3:00 and 5:00 PM. The day of your trip we will meet at 8:30 AM at the OARS Warehouse. It’s best to arrive ready for the river – we’ll board our bus and depart for the drive to Spillway Boat Ramp. Parking is available at our warehouse. On the final day of your river adventure, you will be returned to the OARS Warehouse. You should arrive back by approximately 3:00-5:00 PM. The flow on the Green River is the story of human impacts on a very distinct watershed. 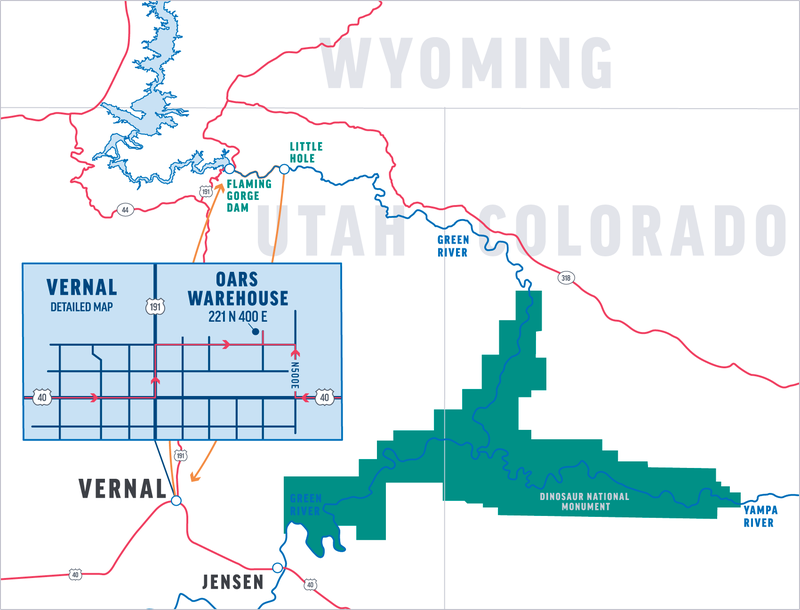 The Green River’s headwaters lie in the Wind River Range of Wyoming, and its stream is repeatedly blocked and diverted, most sizably by the Flaming Gorge Reservoir, not far upstream from Dinosaur National Monument. Thus, its flow is determined by reservoir releases. The Green also will spike in the spring and early summer as the controlling agency at Flaming Gorge Dam releases water to make room for inflow. Peak releases from Flaming Gorge on the Green usually occur between mid-May and mid-June, but can vary widely from early May and into July. Water temperatures are coldest during the high water period and rain gear and warm synthetic clothing will be required. In reality the water is quite cold even in the summer, but lower flows and warmer air temperatures mitigate the risk of hypothermia. The best choice is an amphibious shoe that drains water, protects your toes and won’t come off in swirling current. A retired pair of athletic shoes can work well, too. Sport sandals with a heel strap are a good option, especially on rivers with sandy beaches. Find professional-grade options made by Chaco® at www.chacos.com, the official footwear sponsor of OARS guides. We recommend starting with bathing suit/swim trunks and a lightweight synthetic shirt, adding layers of synthetic or merino wool long underwear and warmer clothes as needed. Mosquitoes can be bothersome at times in certain areas on the Green, particularly after high water drops. Though this happens at different times every year, it is typically in June to mid-July. It’s a good idea to come prepared with insect repellent. Long sleeved shirts and pants may be desirable at times. ALWAYS BE PREPARED FOR CHANGING WEATHER! Especially during the months of May and early June, Utah can experience extreme changes in weather. Wearing cotton items on a river trip is only appropriate when the weather is hot. Cotton does not dry, and wet cotton will chill your body temperature. We provide a small waterproof bag on each raft (17” tall x 9” diameter—approximate sealed size) to hold your camera and other items you might need during the day. While these bags are designed to be waterproof, you may wish to place your camera in a zip-lock plastic bag or waterproof casing for additional protection. Disposable waterproof and panorama cameras are also a fun option. Each participant will need to complete the required trip forms online and submit them no later than 30 days prior to your trip. We advise that you leave your valuables at home or in your private vehicle and take on the river only what’s absolutely necessary. If we are within 30 days of your trip departure, you may transfer from one trip to another, within the same season, for a fee of $25/person up until 7 days prior to departure. You may choose to make a one-time transfer of your payments to a credit account for use during the following season, which incurs a $50/person fee from 29 days prior up until 7 days prior to departure. Transfers made after this time will be treated as cancellations. O.A.R.S. Canyonlands, Inc. and cooperating agencies act only in the capacity of agent for the participants in all matters relating to transportation and/or all other related travel services, and assume no responsibility however caused for injury, loss or damage to person or property in connection with any service, including but not limited to that resulting directly or indirectly from acts of God, detention, annoyance, delays and expenses arising from quarantine, strikes, theft, pilferage, force majeure, failure of any means of conveyance to arrive or depart as scheduled, civil disturbances, government restrictions or regulations, and discrepancies or change in transit over which it has no control. Reasonable changes in itinerary may be made where deemed advisable for the comfort and well being of the participants, including cancellation due to water fluctuation, insufficient bookings (this trip requires a minimum of 6 guests), and other factors. There is risk in whitewater rafting, particularly during high-water conditions. Rafts, dories and kayaks do capsize. You could be swept overboard. Your guide will make every attempt to assist, but you must be strong and agile enough to “self-help” and “float-it-out” without further endangering yourself or others. We reserve the right not to accept passengers weighing more than 260 pounds or with a waist/chest size exceeding 56 inches. We may decide, at any time, to exclude any person or group for any reason we feel is related to the safety of our trips. We are experienced at accommodating people with various disabilities. Please give us an opportunity to make you feel welcome. We need to discuss any special requirements ahead of time. On advancement of deposit the depositor agrees to be bound by the above recited terms and conditions. Prices subject to change without notice.